_Pediopsis tiliae_ (Germar, 1831) Lime Leafhopper in Worcestershire. Pediopsis tiliae (Germar, 1831) Lime Leafhopper in Worcestershire. Family: Cicadellidae.Homoptera leafhopper (Lime leafhopper). Nationally Notable B. This small leafhopper (length 5-6 mm) (01) was swept up by Denise Bingham on 27 July 2013 at Shrawley Wood, Worcestershire. The site was a woodland ride with tall herbage under a canopy of small-leaved lime Tilia cordata. According to Auchenorrhyncha Recording Scheme this appears to be the second record for Worcestershire with a previous record from SO94, somewhere near Pershore. Widely distributed but scarce in southern Britain, including the south-east Midlands and associated with lime trees Tilia, particularly small-leaved lime (British Bugs web site). 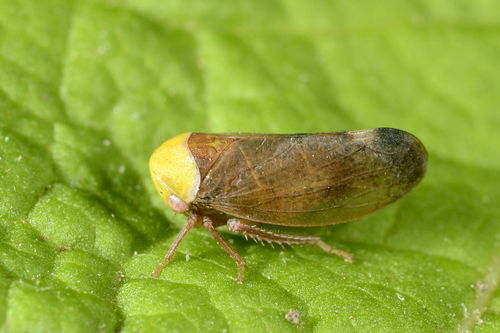 The leafhopper is National Scarce B. This record is towards the limit of the currently known distribution (02) although Dr Alan Stewart has recently recorded it at Preston Montford, Shropshire (SJ41). The species is quite striking with the bright yellow and brown markings. Although according to British Bugs web site some species of Macropsis or Oncopsis can look superficially similar, the combination of the plain yellow face and brown wings is distinctive. With so much Tilia in Worcestershire this leafhopper may turn out to be a fairly common species, but clearly it's not recorded often. It is adult from June to September. 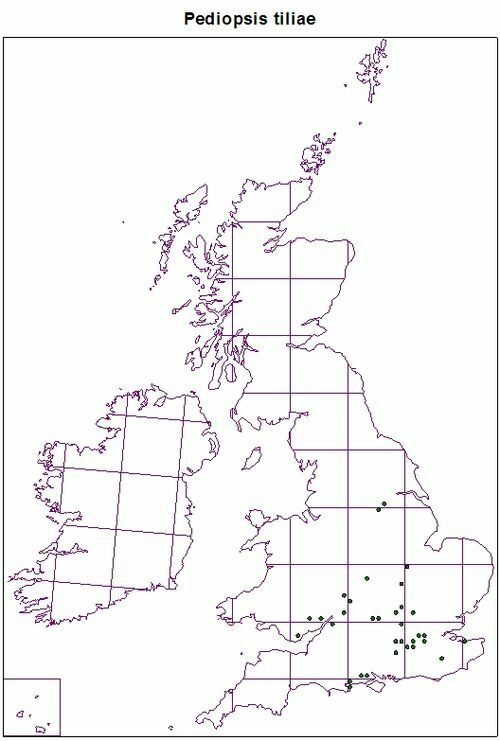 Many thanks to Dr Joe Botting at British Bugs who confirmed our identification and Dr Alan Stewart (Auchenorrhyncha recording scheme) for information on the distribution.